This weekend we went to the Clarksville Downtown Market, and got to experience a completely different type of farmer’s market than what we had experienced before. This one was smaller, calmer and much more friendly. There were fewer merchants, but they were all different, rather than a monopoly on veggies like we tend to see in Nashville. There were also a lot more artisans of handcrafted goods, which was very cool. We got a huge bushel of apples that I turned into apple butter and apple pie apple sauce. 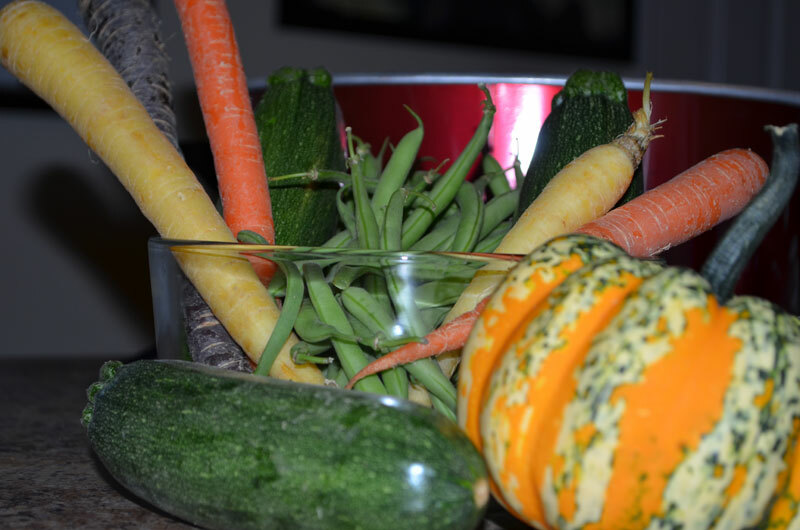 We also got some heirloom carrots and tomatoes, beautiful, fat zucchini, a huge basket of green beans and a wonderfully colored acorn squash. I used some of the veggies in a stir fry as a complement to some frozen veggies and leftover rotisserie chicken. 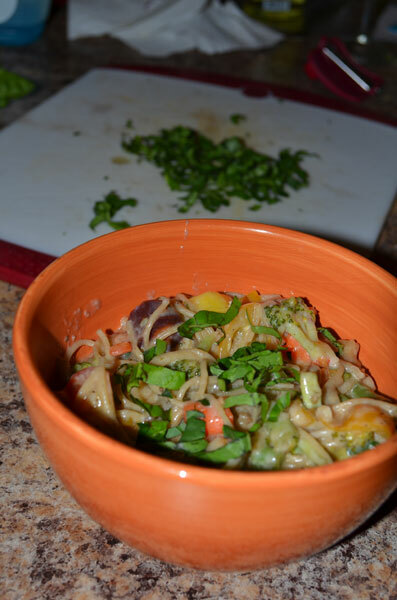 I then created a cheesy pasta primavera with whole wheat pasta. There were 8 different types of vegetables that were lightly steamed and delicious and a lighter mozzarella sauce that blended everything together. Recipe below! By the way, I’m in love with my new camera, and it has a “food” setting on it that helps to bring out some of the beautiful colors. Hence the silly amount of pictures today! Prepare all the veggies, cleaning and chopping. Put all but the garlic in a large bowl. Warm a large, high-sided skillet over medium heat. Add olive oil – once around the pan. Then add in the garlic and cook until fragrant. While the pan is warming and the garlic cooking, prepare your pasta pot with water and set to boil. Once boiling, add in a handful of sea salt and olive oil to add additional flavor to the pasta itself. Then add in the pasta and cook until al dente. Once the garlic is fragrant, dump the bowl of veggies into the pan and toss well. Add another round of olive oil and continue to toss to coat. Top with sage, thyme, dill, and oregano, as well as 1 tbsp black pepper and a pinch of salt. Toss well to coat and cover pan, cooking on medium for 2-3 minutes. After this time, add in the wine, and stir. Then re-cover, and let cook on medium low heat while pasta cooks, stirring occasionally. To make the sauce, first melt the butter in a pot. Once melted, add in the flour, stirring vigorously. Once that creates a paste, add in about 1/2 the milk, continuing to stir. Add in the parmesan and the mozzarella, continuing to stir. Add the rest of the milk, the paprika, 1 tbsp of black pepper and the cardamom. The sauce should be creamy as it melts, and if needed, add a little more milk to increase the creaminess. Continue to stir to evenly incorporate the heat and melt the cheese, as well as preventing burnt cheese on the bottom. At this point, the pasta should be done. Taste test for texture. Drain, and return to the pot. Add 3/4 of the basil to the veggies and stir, cooking just long enough to wilt. Once wilted, add to the pasta, top with the cheese sauce and toss well to coat. Serve with fresh basil on top. 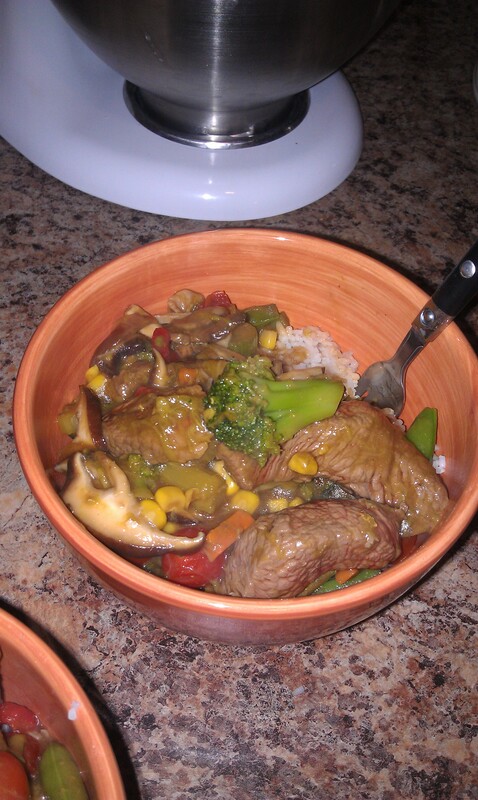 Beef and vegetable stir fry, rather simple actually – though it would have tasted better if I didn’t try to cheat. Not that it tasted bad. Just not as good as it could have. The really cool part about this stir fry is that it takes about 20 minutes. So, perfect for a week night when you don’t have a lot of time. Serve it up with some steamed rice. I’m going to start something new with the new year. I’m going to put the recipe in my post instead of a separate page. Tell me how you like it? 1 lb Steak, sliced thin – the recipe says sirloin, I used a cheaper “every day” steak. I also used the same amount that I would have if I was just grilling it up for the two of us. 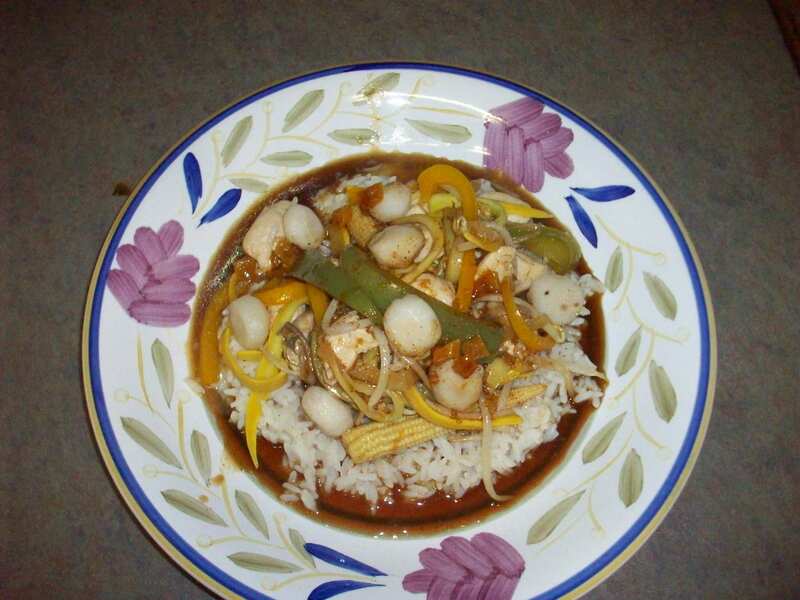 1 tbsp Cooking oil – the recipe suggests peanut or vegetable, I used canola and it tasted just fine. 8 shitake mushrooms, stems removed and sliced thin – I took some help from the store and bought the ones that were packaged and sliced already. 8 oz of asparagus, cut in to 1 inch spears. Use fresh. Trust me. Canned gets mushy. 1 c sugar snap peas or snow peas and 1/2 c red bell pepper strips – I used a bag of frozen stir fry veggies… I’m thinking use the fresh stuff and add what you like. Whisk together the water, soy sauce, hoisin and cornstarch. Set aside. Heat the oil over medium high heat in a large pan or wok. Put in the steak and cook until just medium. Remove from pan and set aside, but keep the juices and oil. Add sesame oil, mushrooms and corn, cook and stir until mushrooms are tender and corn is heated through. Add asparagus, snap peas and bell peppers, cook and stir until crisp-tender. I got this from my Thai Cooking book. See my bibliography. It looks all pretty and turned out really tasty. So this was last week, but I just haven’t had time to post it. I decided that I wanted a stir-fry. The catch is that I’ve never made stir-fry. So it’s time for some experimentation. Everything I used was fresh, which made a good start. I used chicken breast that I cubed up and sauted with some teriyaki sauce (not a lot though). I set that to the side and then started adding in vegetables, which were mainly cut into ribbons (for presentation’s sake – and thanks to my boyfriend). So in goes the onion, zucchini, yellow squash, green and yellow bell pepper and mushrooms, in that order, since things cook slower. I poured half of my previously made sauce over it so that it had something to cook in, as well as a little bit of olive oil. Sauted it all together, and at the last minute, threw in the baby corn to warm it up a bit, as well as the chicken to heat it back up. Toward the end of the cooking process, I made some ten-minute rice to put the stuff on top of as well. And topped it all with the remaining sauce and water chestnuts (I needed the crunchy texture). As for the sauce, that was a total experiment, more so than the meal itself. The goal was a spicy sweet sauce. After some tweaking it was pretty much perfect. I used teriyaki sauce and oil as the base and then I added: minced garlic, mango preserves, zest/juice of one lime, zest of an orange, red pepper flakes, pinch of cayenne pepper, cumin, and thyme. Mixed it all together and added half to the cooking process and the other half over the top of the finished product. I also added some apple cider vinegar to the mix, but that didn’t taste right, so I don’t think I would do that again. I ended up adding in more teriyaki to overpower the taste of the vinegar. They looked so pretty on the plate, I couldn't help but take a picture. We had these huge porkchops in the freezer, and it was just me and the roomie last night, so I thought I’d make something deliciously simple. What’s weird is that the idea just popped into my head when I pulled out the meat to defrost. But it worked oh so well. I actually looked up a honey glaze, and that was as simple as I’d hoped. Mix together equal parts of brown sugar and honey, and heat them up. Sear the porkchops on both sides with salt and pepper. 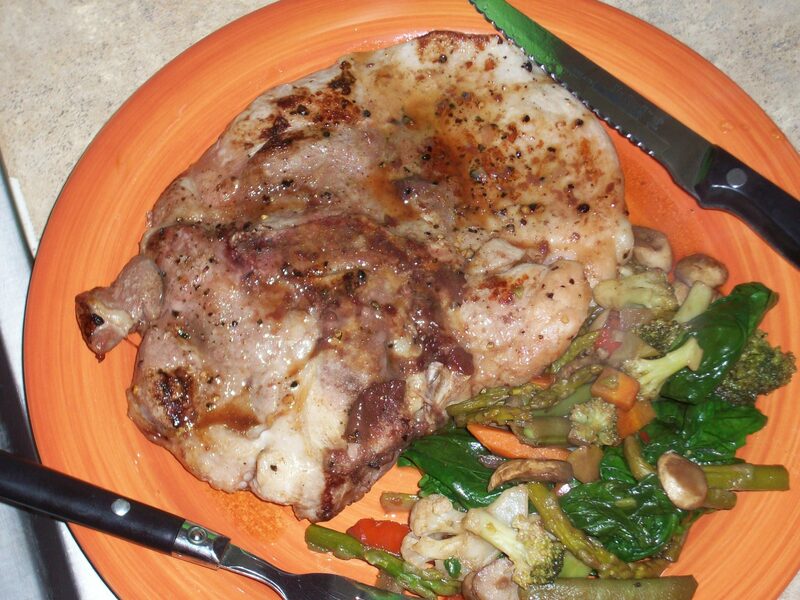 Put the porkchops in a baking dish, pour half the sugar mixture over the top and bake at 350 degrees for 15 minutes. Flip and repeat. I served mine with an asparagus stir-fry that I had in the freezer for a while, and then I added mushrooms, fresh spinach and balsamic vinegar. The vinegar didn’t give the veggies as full of a flavor as I had hoped, but it did give them a little tinge of flavor outside of their own crunchiness.